We usually review children's books here, and, to be honest, I don't think The Bear and the Nightingale was probably marketed as such. The reason I'm not sure is that I came by it in an unusual way: I didn't find it on the shelves, nor was it recommended to me by Amazon or by a friend or on a book blog. No - it was presented to me, among a pile of other books by one of the very knowledgeable bibliophiles at Mr B's Emporium of Reading Delights, a very fine bookshop in Bath. I had been given one of their 'reading spas' as a present. This is a marvellous thing. You go along to the shop, which is in a characterful old house full of interesting nooks and crannies. You are settled upstairs in front of the fireplace in a comfortable chair, with a cup of tea or coffee and a very delicious cake, and you talk to one of Mr B's staff about the kinds of books you like, and then they go off and gather a selection of similar books for you to choose from - the gift includes £55 to spend. Well, one of the books I chose from a cornucopia of delights was this one. It may be intended for adults, but I'm sure it would equally delight teenagers with a taste for fantasy and magic. It's a novel set in the Russia of myth and legend: a Russia of deep snowy winters and wild forests, of sprites and demons, princes and icon painters. When I first opened it up, back in the summer, I couldn't get into it: but now it's winter, and it's the right season - and the book turns out to be enchanting. It is the story of a child born in the northern forests. Her name is Vasya, and as with many of the heroines of folk tales, soon after she is born, her mother dies. Her father is kind, but is eventually persuaded he should take a new wife - particularly to be a mother to Vasya, who is no ordinary child, but a free spirit who runs wild. I haven't finished it yet, but I'm gripped by the story and by the characters of Vasya, cool, forthright, compassionate, strong: and the mysterious stranger who is waiting impatiently for her to grow up. 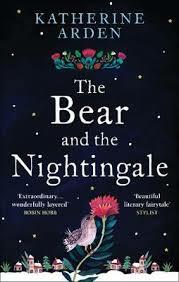 Although Katherine Arden is American, she's steeped in Russian folklore, and the book is like a brightly coloured piece of embroidery from a traditional costume: rich, gleaming, dazzling. It reminds me of Katherine Rundell's The Wolf Wilder, and also of Eowyn Ivey's The Snow Child (though the latter weaves together folklore and the reality of life in Alaska in the 1920s): like them, it cries out to be read in front of the fire on a winter's evening, preferably with snow hurling itself against the windows. An enthralling read for the armchair traveller. STOP PRESS - have discovered that this is the first of a trilogy - hurray! !